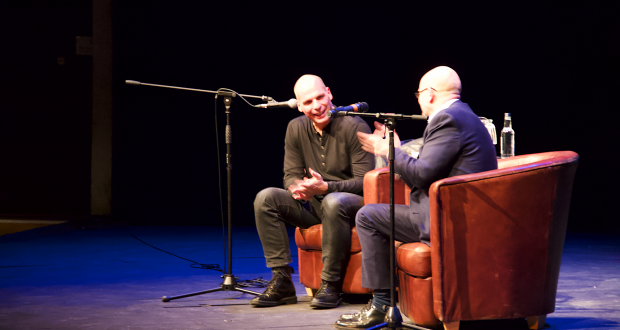 Yanis Varoufakis, best known as the former minister of finance during key parts of the Greek debt crisis in 2015, gave an exclusive lecture on the lessons Europe can learn from Shakespeare at Kingston’s Rose Theatre on 19 March. Varoufakis, considered by many to be one of Europe’s leading intellectuals, gave an exclusive interview with The River after the lecture. “Everything I’ve done after university — books I wrote, lectures I gave — was always motivated by the question: what would I have liked to hear when I was an undergraduate? Why should my professors have done, or lecturers, have taught me?,” he told The River. The event attracted 542 people in the main auditorium at the Rose Theatre Kingston, which was arranged in partnership with Kingston University. His days of learning English through reading Shakespeare helped shape his career to work in the heart of European politics. The lecture titled “Shake the Superflux” – a reference to his favourite speech in King Lear – applied lessons from Shakespeare to contemporary European economic and political challenges. Varoufakis applied the Shakespearean superflux, or excess in society, to themes such as structural inequality and the democratic future of Europe. Varoufakis moved to the UK after his parents deemed Greece too dangerous under the military junta of the Regime of Colonels. “I am a person who should never have been allowed at this stage to talk about Shakespeare,” he told The River. “I’ve never taken a course in Shakespeare, not even at the most elementary level. I told it to the people who arranged this, but they insisted that I should, and I did, and I loved it, but it is an unearned honour and a privilege that I cherish. The former finance minister studied mathematics at the University of Essex in 1978, undertook a MSc in mathematical statistics at the University of Birmingham in 1981 and a PhD in economics back at the University of Essex. Varoufakis, who originally applied for economics as an undergraduate but changed it to mathematics, encourages Kingston students to know what they want from life. “Do that which you love. Don’t think strategically. Because if you try to do something which is lucrative, that you don’t love, and you do it because it is lucrative, or because you think it’s lucrative — firstly, it’s probably the case that it won’t be lucrative by the time you graduate anymore. The Rose Theatre, which opened in 2008, is the largest producing theatre in South West London.